NoVa is also growing increasingly Democratic in its political disposition compared to RoVa, thanks in part to growing minority populations in the region. Obama’s victory in NoVa was perhaps the biggest contributing factor to his sizable victory in the Old Dominion, a state that has not voted for a Democratic candidate since Johnson in 1964. This seismic shift goes unnoticed when looking at a traditional county results map. The nine counties and independent cities of NoVa accounted for 28 percent of all votes in the commonwealth in 2008. 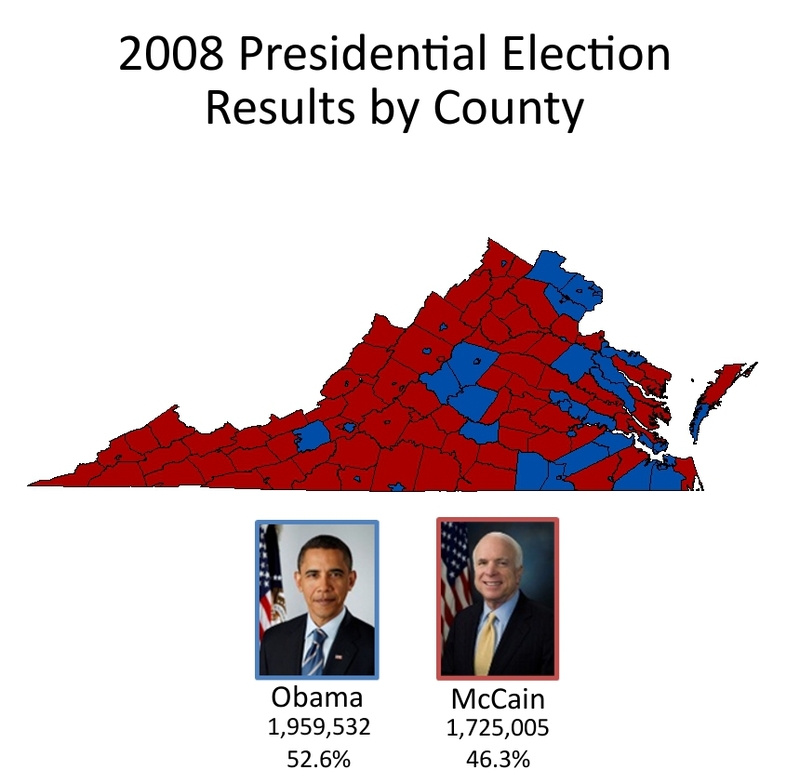 So, despite the sea of red that is RoVa, the blue metro areas of Virginia were more than enough to propel Obama to victory. A better way to visualize the impact of NoVa on electoral outcomes in the commonwealth would be to add another dimension. The map below represents the number of voters in each county as an elevation. Overlaid are the individual precinct results as a heat map. The dark blue regions represent areas of the state with large Democratic margins of victory while the red areas are Republican Country. As one can see, both parties laid claim to several peaks in 2008, but the light blue, Democratic Fairfax County stands out. In short, if voters were mountains, then NoVa would be Everest. 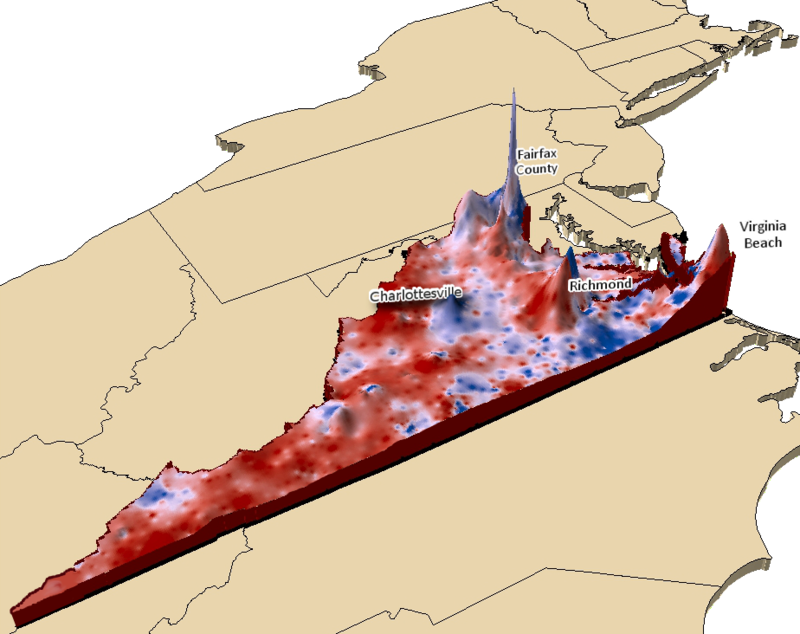 NoVa’s enormous impact on electoral outcomes in Virginia was a long time in the making. As the population of the region grew so too did it grow more Democratic. In 1964, Fairfax County accounted for just under 80,000 voters. By 2008, Fairfax claimed over half a million voters. The GIF below illustrates this growth along with county outcomes. Obama’s wins in the outer suburbs of Loudoun and Prince William counties were key. These counties did not go for Kerry in 2004, and the change in just four years was dramatic. In 2004, 56 percent of Loudoun County voters voted Republican; 53 percent of those in Prince William did the same. By 2008, the numbers flipped with Republican support in both counties dipping below 46 percent. Because these counties accounted for over 300,000 votes in 2008, analysts are watching these counties very closely. If Obama can maintain his support in these counties, then there is a good chance he will again win the state. But these NoVa suburbs are highly affluent and have consistently voted Republican by large margins. Romney has history on his side, and it remains to be seen whether demographics will finally change that this year. So, the intense campaigning in NoVa by both campaigns is not just because it is a stone’s throw away from Washington. NoVa will once again be the key to Virginia, perhaps the most closely watched battleground state of 2012. As yesterday’s front page National Journal article so aptly described, if Virginia goes blue this year, it will represent a fundamental sea change in politics and prove that 2008 wasn’t just an aberration.